Skill is nice, but certification is better. In today’s corporate world, the need for experts in handling massive computer links is growing. A Network Engineer is becoming an important company asset being the one to lay out plans for computer networks and maintain the linkages among computers for a seamless voice, data, video and wireless network services. Skill is one of the vital elements in someone’s career. This is also the perception of numerous companies on how they spot talents to work with them. Though it is true that everybody got what it takes to establish a profession, the competition to for employment is getting tighter. Nowadays, many are skilled but few has a degree or a certification. This shows the increasing need of planning and tending computer networks. Tech One Global and its educational arm, Tech One Learning, in partnership with Microsoft, cater this need by empowering local talents through a certification course in Network Engineering. For every undergrad, learning while earning money is a dream come true, but rarely happens. A lot of students do sidelines or part-time jobs miles away from their craft. Though they earn, they lost the opportunity to practice their degrees in return. With this trend among students, certification courses blossom, providing hands-on experience related to their course with monetary benefits. For a fast-paced world, anyone can now get the knowledge of a 4-year degree within a shorter period of time. Also, not all degrees could readily expose someone to the real working environment to earn while studying. There might still be required units to make a living through skills along completing a degree. Those are the first two things this Network Engineering certification course crushes out from the minds of the people (especially the school leavers) to encourage them continue studying. 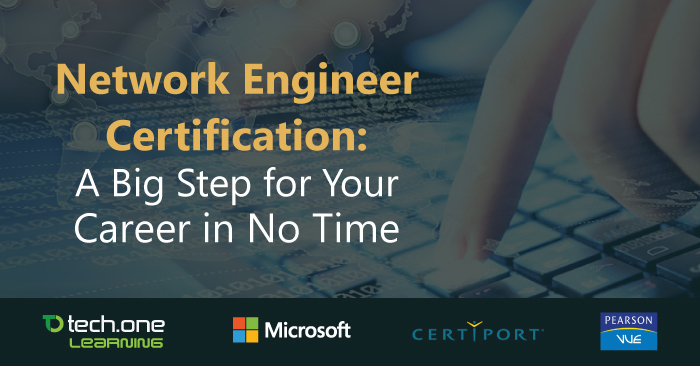 A jam-packed Network Engineering certification that will teach everything needs to be known in this specialization, will only take a year and will make you earn while studying — what’s not to love if your aiming three birds in one stone? Nobody wants to settle on theories. A lot of learners want some action. To cater this, the certification course uses a Virtual User Environment (VUE) with Certiport Exam facilities for nurturing the learning process from information absorption to assessment. This also comes with authentic digital courseware from Microsoft and CompTIA to further supplement the learning. Each session is even more fun and informative as instructors are industry experts that teach through experience. Above all: powered by Microsoft and carried out by Tech One Learning, this Network Engineering course will light up the learner’s potential. These are just few of the many reasons why a school leaver should enroll. Who knows, this might be the first step to your blue collar dreams. Learn more about this course offering here. See more of Tech One Learning’s educational endeavors here.